Most of us can remember sitting at the dinner table, eye-balling our mother or father, as they said in a low firm voice, “eat your broccoli”. Though it may have seemed like an injustice at the time, you can rest assured they were right to do it because the benefits of eating broccoli are really out of this world! Not to mention the fact that many adults actually love its crisp and scrumptious flavour. Whether you’re just a curious broccoli enthusiast, a green thumb itching for a new adventure or if you just simply want to know more aboutbackyar broccoli, be sure to stick your beak into this tasty article. It may seem like a silly question, but it is interesting to know the backstory of this notorious vegetable. Broccoli originated in Italy during ancient Roman times and evolved from wild cabbage. Like cabbage, kale and cauliflower, Broccoli is a part of the cruciferous family, renowned for its eggceptional health benefits. Broccoli spread across Asia for hundreds of years, before being imported to America by Italian immigrant during the 18th century. Since then Broccoli has become a wildly popular, yet occasionally divisive, dinner time favourite for families all across the world. Are there different varieties of broccoli? Premium Green: a compact green headed broccoli that is popular with commercial and domestic growers. Sprouting Broccoli: an eye-catching variety of broccoli, with bluish heads, ideal to grow in cooler areas around Australia. Raab: a slender variety of broccoli that is commonly eaten raw in salads or on its own. Broccolini: a long, slender, very popular variety of broccoli, with small florets and a fun name that is a cross between common broccoli and a Chinese variety - also, it was invented right here in Australia! Each of these varieties will have their own particular quirks and particularities when it comes to growing, cooking and eating, so be sure to investigate each type in more detail before you start to plan your crops or invite the neighbours over for a broccoli-based dinner extravaganza! There really is no denying the remarkable health benefits of broccoli. The list of benefits make it sound like the vegetable of the gods – and maybe it is, considering that the Ancient Romans loved to chow down on this eggstraordinary vegetable. Broccoli can help prevent cancer, lower your cholesterol, improve bone and heart health, as well as reducing the effects of allergens and is also simply a great healthy addition to any dinner plate. Many of these benefits have to do with the fact it contains an array of vitamins and minerals, such as calcium, kaempferol, omega-3, vitamins C and K, just to name a few. Cauliflower also has many of the same benefits of broccoli, which you can read about here. Will my chickens eat broccoli? You bet they will! Your flock will love munch on leftover broccoli scraps from your kitchen be they raw or cooked. In extremely large quantities broccoli, like garlic, can have a negative effect on your flock’s health, but most of the time your chickens will simply stick their beak up if they feel they’ve eaten too much. 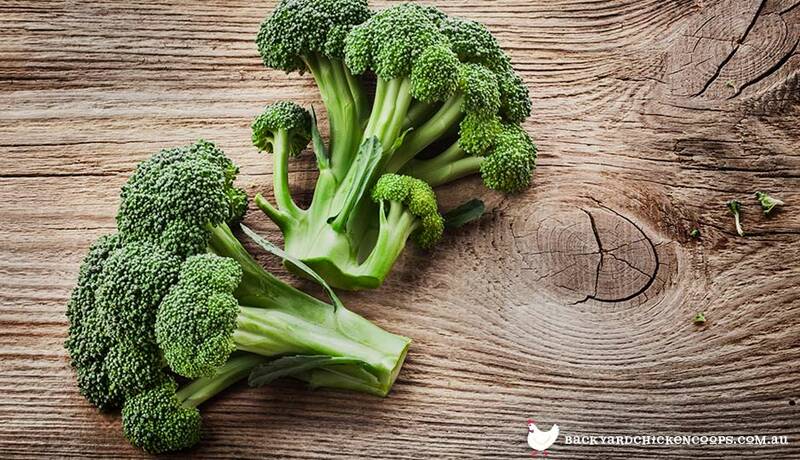 In moderation broccoli has many of the same benefits for your chooks’ health as it does for human health! Find out more about delicious chicken treats in this eggcellent article here. When is the best time to plant broccoli in Australia? It is best to sow you broccoli seeds in plant trays ideally in April, before transplanting them to your garden until July in warmer climates and perhaps even as late as August in slightly cooler areas. Where should I plant my broccoli crops? Broccoli grows best in a sunny yet cool spot in the garden, which is protected from any strong winds that might occur. Also, broccoli are greedy little plants that need a lot of water and nutrients, so be sure you plant them at least 35-50 cm apart from one another. Ideally the soil will be enriched with compost, chicken manure, manure tea or any other eggcellent soil stimulants you can think of before transplanting your broccoli seedlings into the garden. Do your best to ensure that the soil is kept at a PH level of around 6.5-7, as the greatest challenge of keeping broccoli happy, like cauliflower, comes down to the quality of the soil and regular watering. What do I need to know about growing broccoli? Broccoli absolutely loves moisture so make sure you water them deeply and regularly. Placing mulch on top of the soil will help the water sink deep into the earth and nourish the roots of your broccoli. Give your plants a nutrient boost once a week by watering them with compost or manure tea, especially during the final stages of its growth. Broccoli can take anywhere between 10-16 weeks to grow, but generally speaking it is best to harvest it a little on the early side, otherwise it over matures and changes in flavour - no one like bitter, fibrous broccoli! Other than that there’s not too much to it. Just sit back and watch those healthy green flower heads grow! How do I harvest broccoli? Harvesting your broccoli isn’t as simple as ripping the plant from the soil, but it isn’t brain surgery either. All you need to do is cut the large broccoli head out from the green leaves that surround it. 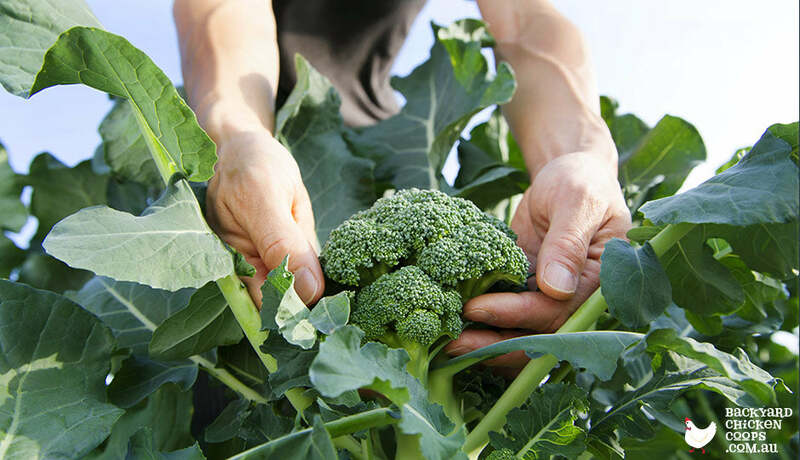 It’s in your best interest not to damage the surrounding broccoli plant too much, as leaving it in your garden can result in offshoot crops, which means more broccoli for you at the end of the day. Store freshly harvested broccoli in a plastic bag in the fridge for up to ten days. What are the signs of a great broccoli? Whether you’re in the garden or at the supermarket, there are some universal signs of a fabulous piece of broccoli that you should know about. Firstly, an eggcellent piece of broccoli will be one consistent colour, be that dark green, sage or purple. Secondly, broccoli florets should be compact and without any blemishes or bruises. Finally, any yellow flowers sprouting from the plant is an indicator it is too mautre and is likely to have a fibrous texture and a bitter flavour. So, spotting a nice hunk of broccoli is all too easy – just make sure its all one colour, the florets are nice and compact, and that there are no yellow flowers sprouting from the plant. What is the best way to cook broccoli? The general consensus seems to be that broccoli holds onto its vital nutrients better when it is steamed. You can simply steam your broccoli on the stove top or in the microwave in a flash - it's just that easy! Roasting, boiling or frying broccoli can unfortunately burn off some of the benefits of eating broccoli in the first place. So, think twice before you throw a handful of broccoli florets alongside a roast in the oven and cook off some of the incredible health benefits. But, if you love the flavour a crunchy roasted broccoli, don't let me stop you! How can I have fun with broccoli in the kitchen? Broccomoli: guacamole + broccoli = broccomoli! Definitely a fun and cheap way to add enormous kick of flavour to a bowl of cornchips! Broccoli patties: perfect for any vegetarian looking for something to put on a burger. Made from a bunch of ingredients, including free-range eggs, so make sure you have some chickens in your backyard. Broccoli and Cheese Soup: if you’re looking for something to warm you up that’s a little bit naughty, than look no further! Creamy, cheesy and filling, could you even ask for more? These recipe ideas are sure to get your imagination going, but be sure to do some research to find out how other broccoli loving culinary gurus have made them. Now that you’ve reached the end of this article you’re no doubt feeling like sinking your teeth into a nice, big and tasty hunk of broccoli right now! Next time you get the chance be sure you pick some broccoli up at the farmers market, or better yet, plant some in your backyard while they’re in season. Keeping chickens is one of the best ways you can promote lively vegetable growth in your garden patch, so be sure to look in our great range of coops, including the Taj Mahal, Penthouse and Mansion, if you’re dreaming of creating an eco-paradise in your backyard!